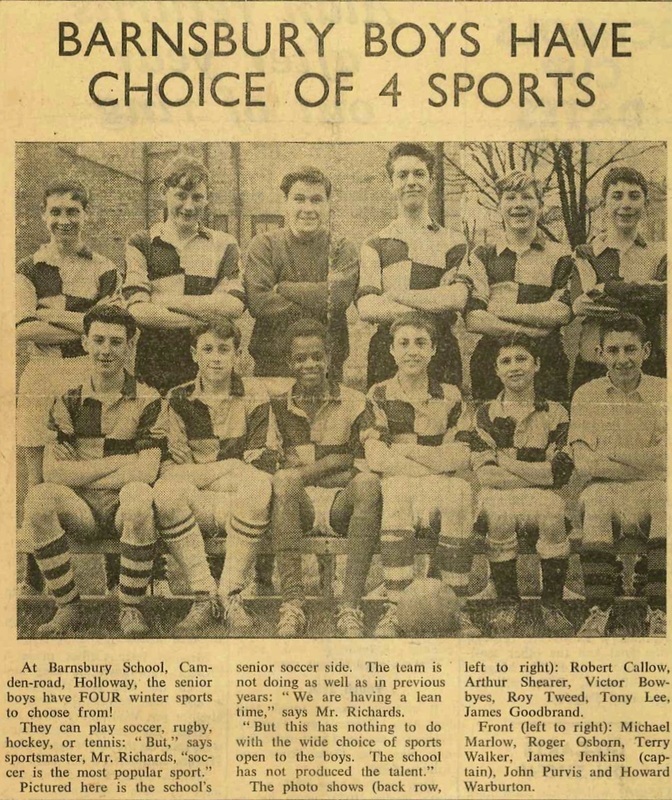 Wonderful clipping from the Islington Gazette of the Barnsbury Boys Senior soccer team 1959-60. This took place at Tufnell Park Sports Ground. Photos were taken by Chris Chrisafis but neither they or he can be traced. Barnsbury were the underdogs but we had no doubt that we would win and go through the season without losing a game. Chris scored the winning goal in the second half. 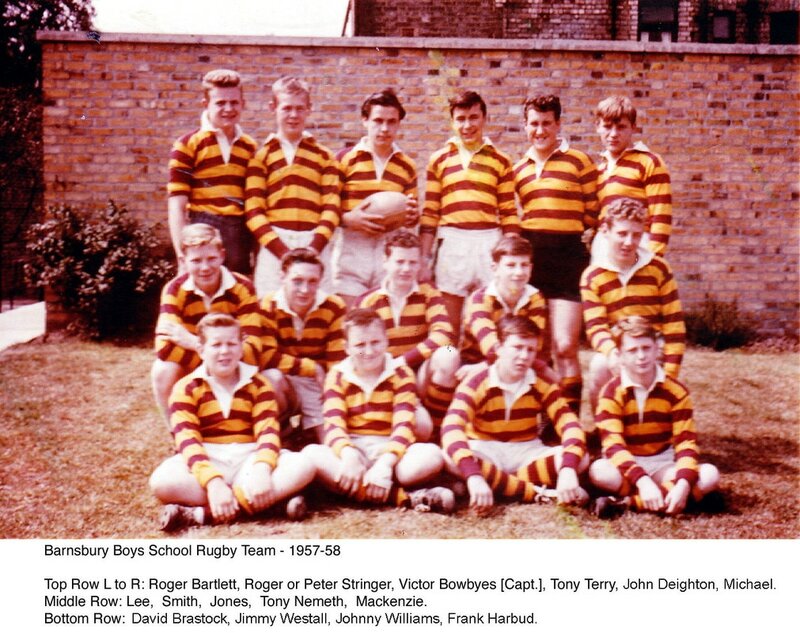 The following photo shows one of the Barnsbury Boys Rugby Football Club teams organized by teacher Harry Bone. 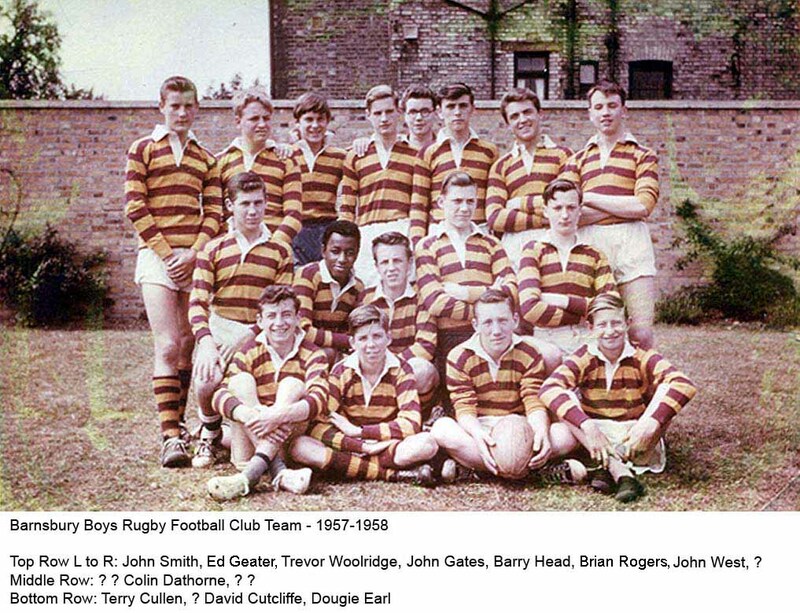 The photo was submitted by Lionel Feldman, but we can only identify one of the boys in the team, John Smith. Would you kindly check the image and, if you can name any of the missing lads, please let either James Sanderson or Barry Page know via e-mail or this website (barnsburyboy1@gmail.com) so the legend can be updated. Thank you. However, the game has caught on and Barnsbury now runs four teams; these are drawn from the fifth and sixth years of the senior school to the (younger) second year of the junior school. The following boys represented the school in junior games: Tepper, Cano, Woean, Martin, Burton, O'Shea, Teece, Diamond, Wharton, Rodosthenes, Etoria, Fish, Powell, Key, Polydorou, Strevens, Landon, Hull, Randolph, Stewart, Bergonzi, Disley. The following boys represented the schoo1 in intermediate games: Westell, M. Lee, T. Lee, Nemeth, J. Smith (4A), Baldacchino, Brandon, Haskell, Tweed, Mackenzie, McCormack, Terry, Bowbyes, Stringer, Bartlett, Harbud. This year's annual rugby exchange had the accumulation of experience from three previous exchanges, and the smooth organisation was due to the careful planning of Mr. Bone and Mr. Richards in conjunction with Mr. Taylor of Treherbert. The party caught the train at Paddington on a Thursday afternoon, and Mr. Taylor and the Treherbert boys were waiting at the station when we arrived in South Wales. We then proceeded to our temporary homes. Most boys made use of the evening by exploring parts of Treherbert, and those who were paying a return visit took the opportunity to look up old associates. The following morning, we all met at Treherbert School, where we were told that we were going on a coach trip to Brecon. The coach was of a very modem design and seemed out of keeping with the small old-fashioned town of Treherbert. The coach began its climb up the New Road, and the higher it climbed, the more the valley looked like a scenic postcard, until our view was marred by the mist that is not uncommon in most parts of Wales. On our way we passed a gigantic reservoir guarded at one end by a miniature tower; the water flowed through the sluice gates and down dozens and dozens of stone steps, creating an aquatic stairway descending some 30 feet. I learned that this reservoir serves most of the valley, even as far as Cardiff. We passed this gigantic man-made lake and continuing our journey, we encountered some high passes, reminiscent of those in Austria; the only guide to the edge of a sheer drop being white painted boulders. Finally, we arrived at Brecon, where we had time for a quick look round the town, and then we were on our way back, passing yet another interesting reservoir. This, according to Mr. Taylor, was the site of a prehistoric lake village. Arriving back at-the school we were served an excellent school dinner by our Treherbert hosts. Then we made our way to Blaen Rhondda Park, where our first game was to be held. The pitch was set in a natural amphitheatre in the hills, and was enhanced further by the addition of large stone terraces, some four feet high and wide, cut in the hillside for the benefit of the onlookers. 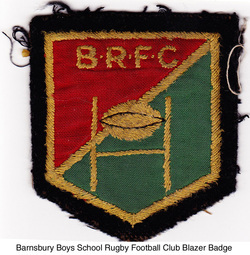 The game began with Bamsbury kicking off against Treherbert. The play was fairly even until we were awarded a penalty kick, which Bowbyes took, but he did not convert it. Play resumed, and the lighter Welsh side could do little with the ball except kick for touch. Both sides had chances to score, but neither made full use of them. Near the end of the first half. T. Davies for Treherbet, took a penalty and missed; this brought the game to half-time, with no score for either side. Barnsbury had been given a great deal of vocal support from a girls' school on the terraces, one of the several schools that had been given the afternoon off to see the game. The second half looked like being a repetition of the first, and was becoming a trifle montonous when D. Williams for Treherbert made a dramatic run through scoring a try in the far left-hand corner. This put Treherbert in the lead by three points. However, T. Jones could not convert a difficult kick, and play resumed. Barnsbury were still fairly keen, but the ball just would not go out along the" three's." Terry tried several breakaways, without success. Slowly, our enthusiasm dwindled with the game having a stale air; the forwards did not keep well together, and if it had not been for the fact that Earl kept play in the safety margin by use of the touch-line, we probably would not have escaped so lightly. Hope was expiring, when Williams again succeeded in scoring for Treherbert; although his try was not converted, these six points were sufficient to drain away any hope Bamsbury had, and when the final whistle went the score was still 6-0. After we had had time to change and eat, we were the guests of Treherbert Youth Club. The Master of Ceremonies made us all very welcome, and although we were slow to take to the dance floor, by the time the last waltz was being played, most of the boys, and also Mr.Richards, had the pleasure of dancing with many of the local girls. The following morning we played Treorchy at Treorchy and lost 18-0. This game was much rougher than that of the previous day, and Diamond was nearly knocked out. In the afternoon some boys went to Cardiff Arms Park to see France beat Wales in a rugby match. This was a most exciting game, even though the final score somewhat disappointed the Welsh boys. After returning from Cardiff, we had the evening to ourselves. The final morning dawned, and the earlier birds of the party grasped the opportunity by exploring the local hills; whilst, the more natural members of the party preferred to sleep off the previous night's activities in the solitude of bed. Inevitably, the afternoon came and the time for farewell drew near. We all met at the station and bade farewell to our newly made friends. A mixed party came to Cardiff to see us off, and as we waved goodbye and the station diminished we all realised that yet another trip to Treherbert was at an end. 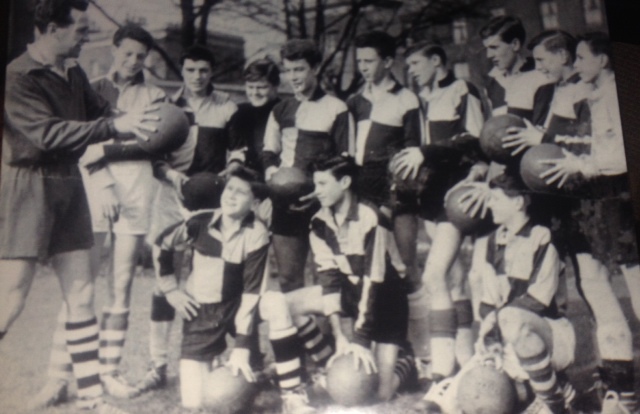 Barnsbury Senior Soccer Team March 1959 at Camden Road. Taken just before we played Woodberry Down in the Clague Cup Final at Tufnel Park where we won 4-0. Photo courtesy of Tony Bernie. From L-R: "Rozzer" Richards, Vic Brown, Terry Anderson, Eddie Geater, Steve Edwards, Tony Bernie, Alan Julians, John Taylor, Laurie Churchill & Nigel Worthington. Kneeling L-R: Teddy Coventry, Ray Webster & Ray Dawe. From the Islington Gazette, 1959. Islington were massacred 6-0 in their home English Schools Trophy Metropolitan semi-final replay against South London on Saturday. The local boys, who, having had the better of a 2 - 2 draw on Dulwich Hamlets ground a fortnight previously, were naturally expected to pull through in this tussle, have largely themselves to blame for their crushing defeat. They were but a shell of the side they were at Dulwich, when they looked probable division champions and appeared to have a chance of battling through to bring the trophy back to the borough again. The muddy conditions were also responsible in large measure for the surprising result. The much larger south London boys obtained a tremendous advantage from the state of the pitch. Islington did not help matters by trying to play a close-passing game. Had they copied south London’s fast, direct, long ball out to the wing style, they would have been far more successful. The result should have been far more respectable for Islington for another reason. They should have had two penalties, one late in the first half and the other early in the second half. The referee saw fit to award them a spot kick only in the second instance. And then despite a well-placed attempt by inside right Stephen Edwards, the effort was saved by a splendid dive from Robert Cane, south London's goalkeeper. Islington's goalkeeper, Ray Outing, also did well and brought off several fine saves. He made no effort to stop south London's fifth goal appearing to be unsighted. Full backs Retter and Anderson impressed with some sound defensive work, but little can be said for the remainder of the team. Jimmy Wilson was unavailable, and so Laycock schoolmate, Alan Smith was brought back into the side to replace him. The first half was even, but whereas Islington wasted two chances when with only Cane to beat, Dawe and Churchill shot straight at the fortunate keeper. South London made the most of their opportunities and scored in the sixth and 21st minutes. South London took complete command in the second half and Islington's frontline could never get going again. South London added further goals in the 52nd, 60th, 73rd and 77th minutes. Outing (Magnus); Retter (Tollington, Capt.) Anderson (Barnsbury) Johnson (Myddleton) Taylor (Barnsbury) Smith (Laycock) Adams (Holloway) Edwards (Barnsbury) Churchill (Barnsbury) Dawe (Barnsbury) Hughes (Magnus). 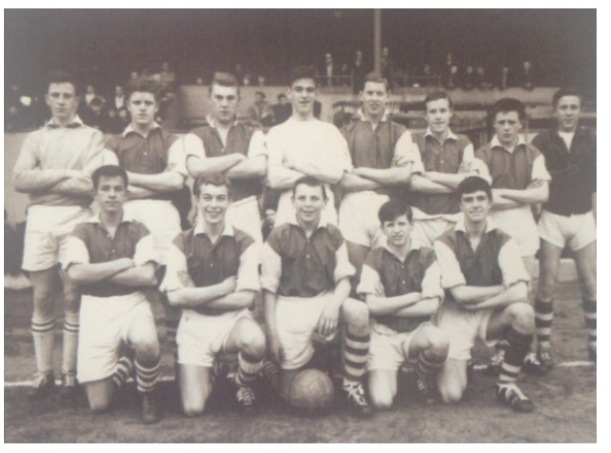 The Islington team that played St Pancras at Arsenal Highbury Stadium. Islington won 2-0. Third from right. John Taylor. Front row from right: Terry Anderson, Ray Dawe, Laurie Churchill, Steve Edwards. 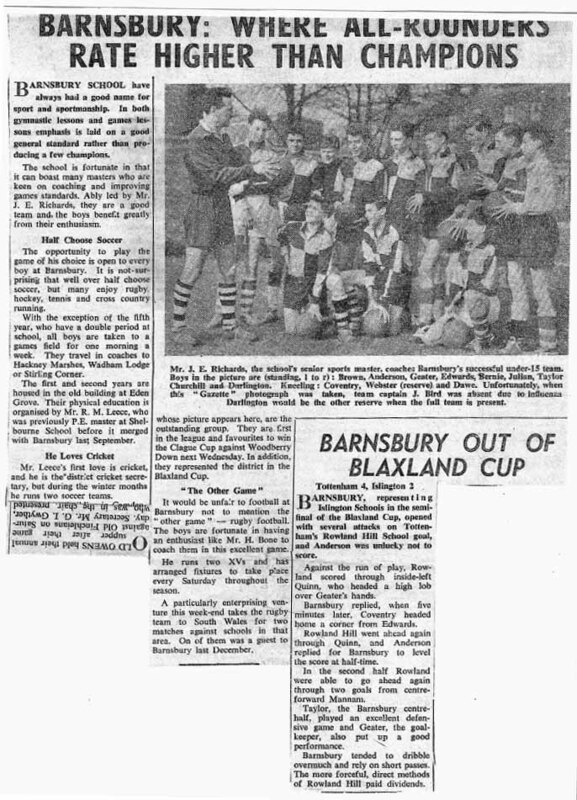 The Islington Gazette featured Barnsbury School for Boys and its reputation for sportsmanship. Also mentioned were the many opportunities in physical education for the boys, and a choice of sports, such as soccer, rugby, hockey, tennis and cross country running that were practiced at several venues. In the accompanying photo, Mr. J. E. “Rozzer” Richards is seen coaching a number of lads in the fineries of soccer. The school team had improved over the three years of senior football. Both Messrs. Richards and Mathews were in attendance. At Under 13 (1957), we finished runner up to Sir Philip Magnus in the final 2-3 score of the Goodwin Shield at Bow Lane, Finchley. There was no league that year. 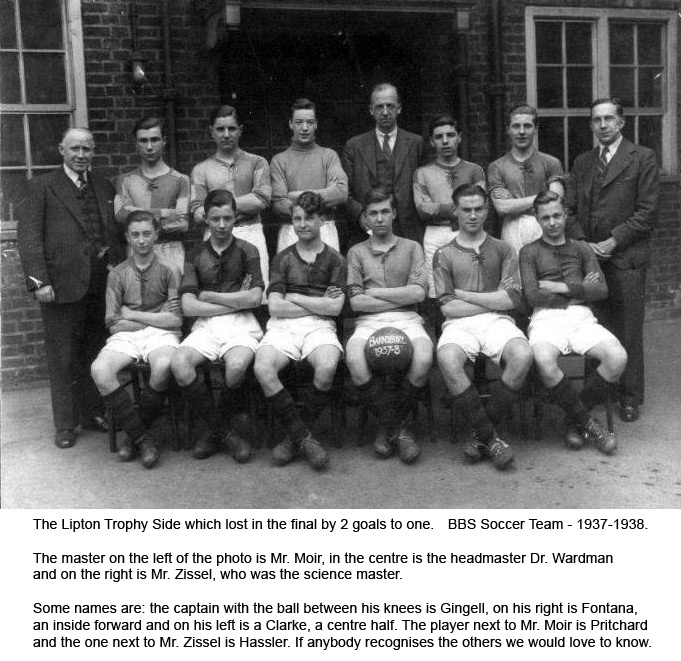 At Under 14 (1958), we finished runner up in the league to Sir Philip Magnus, but beat them in the the Louis Louis Shield cup final 3-2, again at Bow Lane, Finchley. At Under 15 (1959), we won the Clague Cup, beating Woodbury Down 4-0 at Tufnell Park Stadium and Senior League double unbeaten. As reported in the 1959 edition of The Barnsburian school magazine, this team won the Islington under 15s league and cup double: Islington vs. St Pancras (2-0) at Highbury and vs. Tottenham (2-2) at White Hart Lane. Six of the Islington team were Barnsbury boys: John Taylor, Ray Dawe, Stephen Edwards, Terry Anderson, Laurie Churchill and Tony Bernie. Team members for the most part had played together for many years, including at a boys cub called Flomar FC. There was much talent, with Terry Anderson later playing for England u23s, Arsenal and Norwich, Ray Dawe reaching county level and junior level with Arsenal, John Taylor playing in Athenian and Isthmian amateur leagues, Laurie Churchill playing for England at amateur level, Chelsea and Hendon, notably in the FA Amateur Cup Final, and Tony Bernie trialling for London boys before playing for Leyton Orient Youth. This school team represented our borough and in the Blaxland Cup article, it was reported they fell short in the semi final. As I would appear to be a few years ahead of the majority of the Old Boys I do not have much recollection of the other names on the mailing list, however one name jumps out; Takis Polydorou. He was of a commanding size and played one and two years above his age group with great success, I think he also threw the discus and headed sorry, putt the shot. I seem to recall more of his rear end as he played in the second row of the rugby team with me at outside half or occasionally wing forward. We were both on the rugby trip to Treherbert where we played the local lads and a team from Treorchy. The local Rhondda Press reported us as the heaviest schoolboy pack to visit the valleys with Takis helping to boost the poundage (Nay stones) I believe the pack weighed in the region of 90 stone, and for 16/17 year olds that was quite big. We were quite confident at the beginning of the trip as we had beaten the South Wales lads when they visited us in London. Oh, how our perceptions changed. They may have been slighter built than us but they were lightning fast. I was having to use the scrum for protection and lined up deeper and deeper, all to no avail I spent most of the two games on my back with two of the opposition on top of me. We were soundly beaten. We subsequently learned that the teams we played included Welsh Schoolboy Internationals and one lad from Treorchy who was the Welsh age group 100 yards champion. This did, however, have advantages and disadvantages. The advantage was that girls from both Treherbert and Treorchy were keen to see that I for one had suffered no ills. The disadvantage was that the local gang from Pontypridd had laid down the challenge and were on the lookout for us in the evenings. Thankfully the girls new just where to go to avoid them. I later heard that at that time a certain Tom Jones was a leading light in that particular gang. Would we have known that we could have been on a pasting from one who later became so famous? I like to think he was looking for us so that he could serenade the girls and us boys. Yes, and Welsh pigs might fly. During my early teenage years I was quite a fit person, swimming and cycling being my sporting passions. I really must try to get back to being fit again!! Jaunts out to Southend – On - Sea were regular occurrences, as it was only 40 miles each way. Shorter trips to Runnymede, with a swim across the Thames and back, were a summer treat. Swimming with the Islington Swimming Club, based in Essex Road Baths, was a weekly event. 30 lengths Breast Stroke, 30 lengths Back Stroke, 30 lengths Front Crawl and 10 lengths of Butterfly, followed by a game of Water Polo took up Thursday evenings. So, with my being fairly good at swimming, in 1965 I became Court House Swimming Captain. Not a glamorous as it might sound though, most of the rest of the swimmers in the House were pretty abysmal! For them, it wasn’t so much swimming, as managing not to drown, whilst getting from one end of the Hornsey Road Baths pool, to the other. What made the swimming gala exciting was none of the other houses faired any better. Each House had club swimmers as House Captains and that was about it. Most of the rest just flapped about. One swimming lesson in ‘65 we were all told by Rozzer, to go to the top board – (thirty foot!!!) and jump or dive off. Now I was a swimmer, not a diver. Divers need to be able to swim, but swimmers do not have to be able to dive. Anyway, I get to the edge of the board and look down and with my head now being 35 odd foot above the water, my nerve went and I wouldn’t launch myself over the edge. Rozzer screamed at me continuously until I finally jumped off. I’ll never forget that horrible feeling of plummeting towards the water. I froze on the way down and hit the water star fashion – coo, that stung! Having dragged myself to the side and got out, I was told to do it again. Reluctantly, I climbed the steps to the top, but now knowing for sure that I didn’t like it, again refused to go over the edge. After lots of verbal abuse, I was told to go down to the intermediate board and go off that. It was still 15 feet high and that was still to much for me and so to humiliate me further I was then banned from swimming and made to go to rugby instead. Court house, with the swimming captain banned from swimming, we were not going to stand much chance of winning anything at the Gala. Rugby, the last out of the changing rooms had to run round the fields of Wadham Lodge TWICE! That would be me then and that was the field, not the pitch! That done Colin Proctor, a tall bespectacled lad and me were told by the welsh sadist to stand as tackle practice targets for the rugby team. Colin went first, he was tackled, he went down face first into the muddy turf, his specs flying from his head. He was hurt, muddy and blind, searching for his specs in the mud, he looked a sorry sight. My turn, I know what’s coming, I look nervously over my shoulder and the team player runs and launches at my legs.......... and I step to the side. Splat, oooff, slide - missed me. More abuse, told to stand still and another team player runs and launches to my legs. Somehow my right foot raises and boot studs connect with a face. As I fall down there is a scream from behind and when I turn there is a face pouring blood looking at me. With more verbal abuse I’m sent back to the changing room and told that I’m banned from rugby. Result! Two week’s two bans. Must be a school record! Still banned from swimming, it was of to cross country at Parliament Hill the following week. Not at all keen, but Philip Ferguson said “Stay with me, get to the front and head for those trees over there” Off we went at break neck speed towards the trees, well ahead of the pack and once there we hid in some bushes. The pack went by and once out of sight we walked across to the other side of the field and waited until we heard the pack approaching from their 5 mile run. We then jogged along, letting the pack get closer, and then sprinted to the finishing line. Cross country seemed pretty easy! Two more weeks and it was back to swimming – much nicer! I can remember competing with Roger Ruthen in the long jump, triple jump and playing rugby. He was I believe outside centre and I was on the wing. I understand he lives in Australia, oddly enough I was there in 1984/85 on a company move and worked in Sydney and lived in Mosman. The first time I took to Aussie waters was when we first arrived and was staying at the Manley Pacific Hotel. As a family we ventured to the beach. My son and I started walking into the water for a swim. I looked around and saw my wife beckoning us back. We had no idea what was going on but she was gesturing to us frantically. We turned and came back to find out what the problem was. Apparently sharks had been spotted in the vicinity and a siren had gone off to tell everyone to get out of the water. A plane was tracking the sharks movements A hush went over the beach and after 20 minutes an announcement was made to say that the sharks had left the area and we were invited back into the water at our own risk! With that we packed our bags and headed back to the hotel pool! Having seen the damage some of these sharks had done to the steel nets around the bays, we decided we did not want to be lunch or any other meal!! So you must have been playing rugby round about the the that Mr Hamlyn was the ref? Ballard & Woody are the only people that I can remember the others being a very tall guy and a red haired guy who carried a lot of weight and young a kid who had Polio. At the time Tony and I were playing rugby, "Leatherprick" was running the team. Some other members of the school team of our year that I can remember were, Paul Tully, Robert Kirkwood, Dom Strinati, Robbo, Dennis Nicholls, Big Theo, Tom Pratt, Enzo ? now I have run into brain fade. Some went on to play for a colts team that met at the Bird in Hand Crouch End. I have dredged a school rugby incident of no real importance from my memory. Maybe Micky Isaacs, Peter Duplock, Denis Bailey, Dave Woozley, Rob Kirkwood or Johnny Pearce can remember it. Form 1A, just another day. A teacher comes into our class and speaks to our teacher; the second year rugby team are a man short for an inter-school game that afternoon and he wants someone from our class to fill in. The visiting teacher slowly looks over the class, some of whom are sitting a lot straighter than usual. His eyes alight on Billy Hunt, possibly realising that he is the school goalkeeper, and he picks him. Within seconds Bill has left the class, beaming. My thoughts are as follows, why a first year? Surely there must have been several kids in the second year reserve team to pick from. Why our class and I say this because it appeared to me that in soccer particularly, very few kids from the lower classes got a good look in. And why our class? Bill Hunt had never played rugby in his life as far as I know. Lots of the kids in 1C were in the school team; Ruthen, Tully, Pratt spring to mind immediately. Were they asked or did Bill fit a particular position? I’ve got no answers but perhaps someone can enlighten me further and as far as I know, it never happened again. Oh, and I think they lost. I remember that incident as well as I was seated next to Billy. I need to correct you though as you omitted the little exchange between the teacher, Mr Rees I think, and Billy. Teacher to Billy- "what do you know about rugby"
Billy replied "you have to pass the ball backwards". Teacher "Right, you'll do, you're playing prop forward tomorrow". Also a little sporting anecdote of my own. One day Rozzer informed John MacDonald, Nobby Wheatley and I that we had reached the regional boxing finals to take place the following day at a school in East London. He generously advised the name and address of the school, but failed to provide any directions. In the absence of google or mapquest, my father provided directions and this entailed travelling by bus and underground to arrive by 5pm as instructed. Once the medical was completed, we were informed the time our bout would take place, though not the name of our opponent. It soon became clear we were out of our depth as we were dressed in house football shirts, shorts, socks and the regulation black plimsolls (no designer trainers in those days). Whereas most of the contestants from East London belonged to one boxing club or another and they were dressed in full boxing gear - proper vest and shorts; flash boxing boots and dressing gowns with the club name on the back. Also, since Rozzer failed to attend and did not inform us that we needed a trainer in the corner during the bout, we were nearly disqualified because we did not have a trainer. Fortunately (or perhaps unfortunately as it turned out) some guy we didn't know volunteered to stand in. At the end of each round during the bout whilst my opponent was receiving instructions from his trainer, the guy in my corner stated the obvious, kindly informing me that I was behind on points. Needless to say all three of us lacked the experience of the East London boys and were soundly beaten. Sad thing is; the next day back at school, Rozzer didn't even ask how we got on. Nice one Wooz, what a story. Typical Rozzer or what? He was a cold indifferent man or was it that he'd had enough and didn't care anymore? Gonna put the tale in the Mag if that's ok with you. Also thanks for putting me straight about the BH story. Would have sworn he left the classroom that afternoon. But why a first year? Answer that one. Weird. You may be right about the afternoon it was just the question "what do you know about rugby?" that I wanted to emphasize. Yes, go ahead put it on the website - glad to make a contribution at last. Most of my memories are sport related. Another little tale I have mentioned to you before. We were playing football for the school against Woodberry Down (at least I think that's the name). You were laying on the ground after making a tackle and the ball ran loose to me. I lashed the ball upfield just as you looked up from the ground and the ball smashed you square in the face. Think you wandered round in a daze for the rest of the game (which we won by the way). Only other incident remember is when 3 or 4 of us got marched down to the bonk by that awful little woman Spanish teacher who had no idea how to maintain discipline in class. All of us ended getting a few whacks with the cane. That ended my interest in Spanish. She was such a disappointment after Mr Bone. Taken me weeks of racking my diminishing brain to come up with those. Sad really. Now here’s a funny thing. I know nuffink about Rugby, for me the ball is just the wrong shape. I know that Bill(y) Hunt was the school ‘keeper as I had been the ‘keeper at Newington Green and thought I might get a look in at Barnsbury but BH kept me out. Anyway, some time ago I said in a mail to you that my first class (1B) was Mr Hughes (Not McHugh) and my second year teacher was Mr Petherick. You told me I was wrong and that your first class (1A) had Hughes and so I must be wrong, but maybe I WAS right. If you had Petherick in the first year and Hughes in the second, that way your first year form teacher would have been Petherick who also took Rugby; after all he WAS Welsh. So the other Rugby teacher (Martyn ?) decided to call on his Welsh taffy leak eating mate to see if he could recommend a mug to be roughed up in the scrum (whatever that is), and Petherick decided to put Hunt forward as the sacrificial lamb. As a bye the bye I did play rugby in the 5th year once. Sibley and Lewis were both players and persuaded me one Friday to get on the coach to Mill Hill rather than Hackney Marshes to have a game of house v house rugger. I seem to remember that Taffy Lewis gave me a right hander that I still owe him back to this day. On the subject of Boxing. When I was in the 1st year my free lesson was sport which included boxing and who did Mr Leech put me in with - yep, Podgy O’Shea and so there I was getting a boxing lesson every week. Still didn't help me much as I got bullied by his mate Martin Sturgeon but that soon ended once Podgy found out that his mum was friends with my mum. In my first year at Eden Grove we were all assembled at Hackney marshes after the coach ride, Despite being in our footie kit, we were asked if there was anyone who would be interested in cross country running. Many of us thought this was an opportunity to skip out of more lessons and go off on a jolly, modern term, same thing. This was a trick and I fell for it along with a large number of others. We were separated from the footballers and with masters making sure we didn’t slide off or sneak back to the footie boys, took off on a run around the marshes, while those clever enough not to volunteer played soccer. An early lesson about not volunteering unless you are aware of all the facts. The next week we were threatened that they had the names of all the boy runners, another trick, they lied, who wanted to do running and the same split occurred so no soccer for me again. Sod this running lark I thought and the next week I hung out in the crapper until the runners had gone off, survived a check by a master searching the almost outdoor changing facilities where a donkey would have felt at home, ‘won’t be a minute Sir!’ I called out in a strained voice when he beat upon the crapper door. I waited until he had gone off after the rest and sneaked over to the footie fields and that’s where I stayed. I was lucky as the footie team I got into was being supervised by an English teacher. Mr. Mozello, who liked me as I said what a good teacher he was and his face beamed when I scored a goal. I only hope he wasn’t after my arse. A few more made the great escape over the next few weeks. It later transpired that the school hadn’t booked enough footie pitches for all the boys and about a third were tricked into running. 50 years on, I can still see the other poor buggers now running round and round while we kicked the ball in the mud and their faces looking our way, wanting but helpless. The annual cross country run where the whole school was bussed up to Parliament Hill Fields was not without incident. There was a little skinny shrewish looking boy who was a good runner, I can’t remember his name but he was a member of the Crown and Manor Club by the Canal Bridge, Hoxton and entered into many an important cross country run event. I tried several times to get into that club but 3 blokes in my flats who went there blackballed me, I have always regretted this and could have done well there. I got my own back on one of them sometime later when he was given 6 months to 2 years in Borstal for being found in possession of a bread knife in the Angle Arcade, I fiddled with his girlfriend whilst he was locked up, that’ll teach him. Someone grassed me up of course so when he came out on a week’s leave I had to keep a low profile. So at the time I had to settle for the 58th Boys Brigade who went to the Union Chapel, Highbury Corner. Some great stories to tell there but back to the cross country race. At Parly almost the whole school were bussed there and lined up at the start. That skinny kid was in the front and even looked as though he wanted to run and win, which I think he did. After the initial burst of enthusiasm, about 500 yards the race had already strung out along the bottom ponds and a little group of oiks had stopped, some even lit up. This was until out of the morning mist Rozzer Richards appeared along with a whip made out of a tree root. Swish, swish, swish went this whip, this caught our attention. Rozzer said to me ‘Stech, I’m surprised at you’ adding ‘if you don’t come in the first fifty runners you’re going to get this‘ pointing to the whip, which he then swished about again with gusto cutting the air like a hot knife through margarine [we couldn’t afford butter in those days] . Not wanting to get swished by Rozzer I set off at a deadly pace, it was a tall order as possibly 250 boys were in front by this time. Anyway its surprising what the threat of a swishing whip across your arse will do and I ran like the blazes and recall coming over the top of Parly Hill and seeing the path reaching down to the changing rooms and running track below with a few boys shuffling down the hill in front. The rest was a cake walk as I took advantage of the slope and moved into sprint mode, where the energy came from I don't know but I just made it to be in the first 50 and escaped Rozzer’s whip. The bugger checked me out as well as he had people taking the names as we passed the finishing line. The others, I don’t know about and didn’t care, I had run a race I was proud to have finished in the first 50, albeit 47th after lagging behind and more importantly had escaped a thrashing. There was another cross country race at Scratch Wood, Sterling Corner where we were taken on occasions and I recall it was cold, ice, rain and mud and probably worse than the conditions on the Somme except no one shooting at you but I'm sure they were trying to kill off a few of us. Some boys got lost in the woods, most made it back to those lovely tepid, hardly any water coming out of the shower head facilities. If this had happened nowadays teachers would have been put up on attempted mass manslaughter charges! Yes, the idyllic sports fields at Sterling Corner, Barnet, and the realities of bushwhacking through neighbouring Scratchwood. How well I remember them. Wednesday morning was earmarked for sportsday activities. Boarding the string of coaches (Tilling line, I believe) at Camden Road was chaotic with boys clambering over one another to claim the choice seats. Many making a bee-line to the back where one could sneak a fag or two. The journey took us through the outlyings of North London and the rural suburbs, passing through Barnet and the village of Arkley; then to our destination at Sterling Corner. The modern building that dominated the 400m oval, marked out track and field areas, soccer fields and cricket pitches, provided us with change room facilities and the all-important shower room. The teachers organised us into teams for the various sports. In the winter I shunned soccer and favoured the cross-country running efforts through Scratchwood, an area of wild woodland where the rain sodden tracks took us through stretches of low lying water and mud sucking swamp. Invariably we would return caked from head to toe with remnants of Hertfordshire clay. But then afterwards, oh!, those warm water showers were a godsend. Rozzer was in his element strutting around under the douches displaying his manhood for all to see, flexing his biceps and rippling his hamstrings with gay abandon. In the warmer months I preferred track and field endeavours with an emphasis on hurdles and long jump. Several other lads were keen athletes and some such as Takis Polydorou at throwing the discus or putting the shot were very promising. I certainly remember Michael Key was adept with the javelin. After the morning's session it was back onto the coaches and the return drive to Islington. Many kipped on the way back, and others found the opportunity to have another drag in the back seats. "Bill" Bayliss always turned a blind eye to what was going on, and even may have contributed with his own dog end. Today, Sterling Corner is a derelict site. 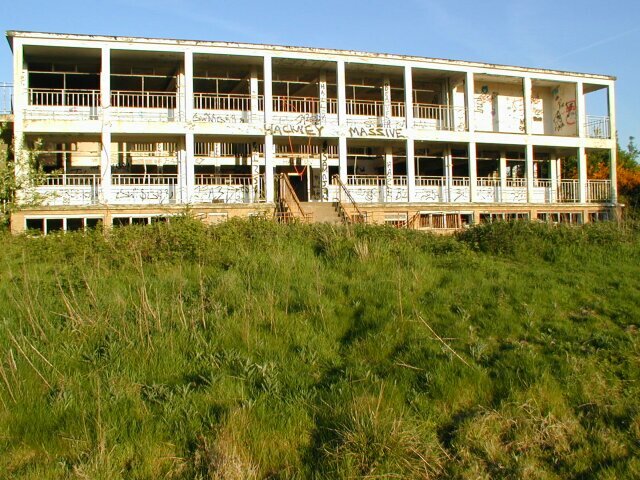 The activities building is vandalised and covered with graffiti; the cinder track disappeared and the once immaculate sports fields now a wilderness complete with abandoned cars and other debris. The following Websites and images may be of interest. Stirling Corner (or Finsbury) Track Stirling Corner Sports Ground, Barnet Road Type: Cinder (no longer exists - derelict).